TravelEurope Lake Lugano hotel reservation service provides you with a wide variety of lodging and hotel options, from cheap hotels to luxury accommodation in Lake Lugano. Quick and easy hotel reservations with instant confirmation and great value for money whether you travel for business or tourism. Select travel dates and find all available hotels in Lake Lugano, check out guests reviews and locate properties on Lake Lugano city maps, book your favourite accommodation with no pre-payment. All rates are in Euros and inclusive of all taxes. 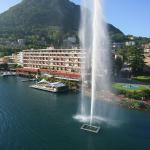 Hotel Europa is located on the shores of Lake Lugano, near the ferry landing point Porlezza. This welcoming 3-star hotel offers its guests free parking and internet point in the lobby with wireless connection. 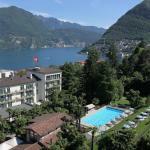 The Hotel International au Lac overlooks Lake Lugano, within short distance from downtown. 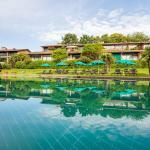 It offers an outdoor pool, a bar with Internet access and a restaurant with local and international cuisine. Acquarello Swiss Quality Hotel is located in an elegant building completely renovated in April 2002. This hotel enjoys a privileged location right in the centre of the city of Lugano. Residence Principe Leopoldo welcomes you in the charm of a flower garden in a quiet park. An enchanting place for visiting Lugano but staying in contact with nature in a relaxing and rejuvenating atmosphere. The Hotel Residenza San Marco is a 3 star hotel located in Porlezza, on the shores of Lake Lugano and surrounded by a park of 30,000 sqm. The city of Como is just 40 km away.